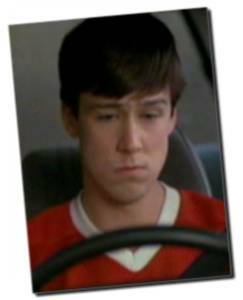 Alan Ruck plays Cameron Frye, Ferris' best friend who is constantly ill. Cameron Frye doesn't experience what one would call the best home life, with an ignorant and uncaring father, and a mother not much better, Cameron's anxiety is one of the catalysts to Ferris' decision to plan the ultimate day off school. Born on 1 July 1956 (but quoted in the IMDB as 1960, see below for explanation), in Cleveland, Ohio, Ruck was actually 29 years old during FBDO. Today Ruck is probably best known as the politically incorrect Stuart Bondek, the Mayor's chief of staff, in the TV series Spin City, starring Michael J. Fox. However, Ruck most recently completed a movie in which he plays a character light-years away from Stuart in the cable telefilm about Apollo 13, From the Earth to the Moon, which was executive produced by Tom Hanks. Ruck first became interested in acting during high school. He studied theater at the University of Illinois, and after graduation, he began acting professionally in Chicago, appearing at the Goodman, the Wisdom Bridge and Apollo theaters, among others. He worked in Chicago for five years starring in numerous stage productions -- and also appearing in his first two feature films, Class (another 80's classic with Andrew McCarthy, Rob Lowe and John Cusack) and Bad Boys. Ruck made his Broadway debut in 1985, originating the role of Don Carney in Neil Simon's Biloxi Blues. Ruck's filmography includes films such as Twister, Three for the Road with FBDO co-star Charlie Sheen (Garth Volbeck), Bloodhounds of Broadway, Three Fugitives, Young Guns II, Star Trek: Generations and Speed. On the personal side, he is currently married and has two children. These pictures to the left are not Shaggy from Scooby Doo (hehe sorry Alan) but they are actually yearbook pictures of Alan taken from the Parma Senior High School Yearbook, and kindly scanned and donated by Rick Spatholt (who also graduated Parma Senior High School, in Parma OH tho a little more recently than Alan). 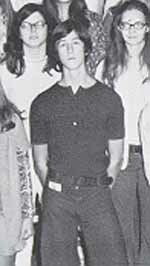 Craig Stepanek who's brother was Alan's friend tells me Alan graduated from Parma Senior High in 1974 (meaning he was really actually born in 1956 or possibly 1955, contrary to the date provided by the IMDB). And from the pictures Rick had seen seen in a few yearbooks, he says Alan was really active in the plays and such.